Solve the unique email security needs of your organization - whether you have one user or 100,000. From appliances and software to virtual appliances and services, our flexible solutions offer powerful protection against spam, phishing, viruses, and even ransomware threats - at a low total cost of ownership. Protect up to 1,000 employees with affordable, powerful anti-spam, anti-virus and anti-phishing capabilities with content filtering and outbound email protection. Achieve the highest email protection performance and enterprise-wide resiliency for environments with up to 10,000 employees. Receive total inbound and outbound email protection in a highly scalable VMware environment. 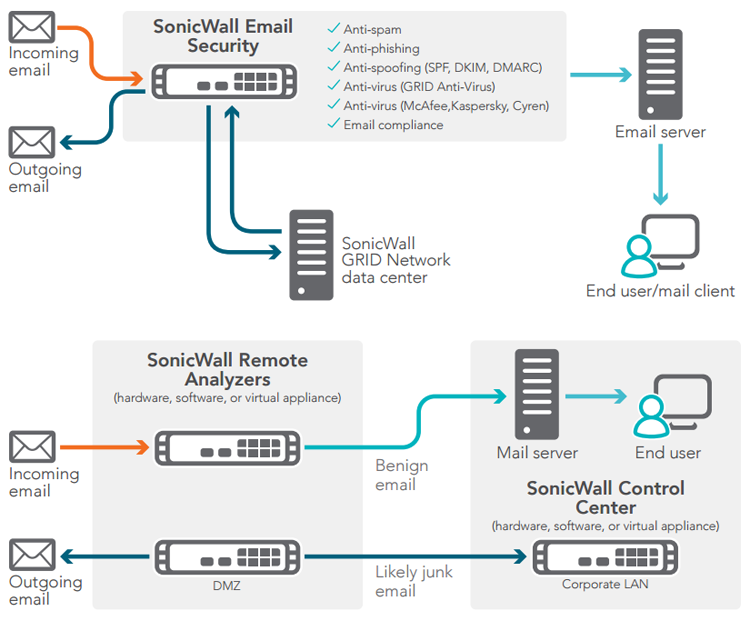 Experience the same powerful security as a traditional SonicWALL Email Security Appliance, only in a virtual form. Reduce capital costs, ease migrations and optimize utilization by leveraging your shared computing resources. Benefit from complete inbound and outbound email protection on one system with the flexibility to change, update or add onto to your Windows-based system. Designed for organizations of 25 of more users, this software offers the same robust benefits as a traditional SonicWALL Email Security Appliance, but allows you control both your platform and the email security application. Offers superior, cloud-based protection from inbound and outbound threats, including spam, phishing, zombie attacks and malware, at an affordable, predictable and flexible monthly or annual subscription price. At the same time, it minimizes upfront deployment time and costs, as well as ongoing administration expenses. 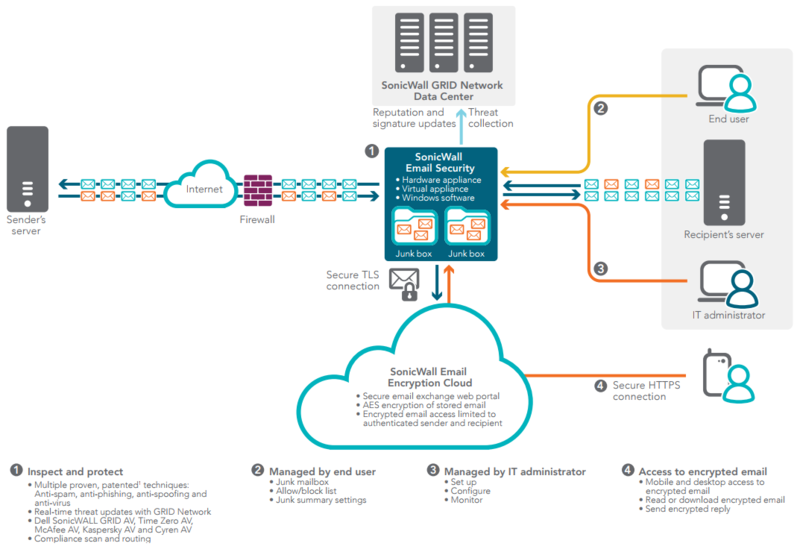 Ensure your email is safe, productive and cost-effective with the SonicWALL next generation Email Security appliances, software, virtual appliances and services. Protect your email from ransomware, viruses, spam, and other zero-day emerging threats ─ while meeting email compliance mandates ─ for one individual or a 100,000-person company. Experience comprehensive email protection from emerging zero-day threats in one, easy-to-manage solution. Keep your entire organization's email safe and meet the needs of 1 to 100,000 users with SonicWALL next-generation Email Security series appliances. Protect against emerging zero-day attacks with the Capture Advance Threat Protection service. Our cloud-based sandboxing technology scans a broad range of email attachment types to detect advanced threats, analyze them in a multi-engine sandbox, block them prior to a security verdict, and rapidly deploy remediation signatures. Leverage multiple, patented protection techniques to stop spam and email attacks. Check email sender IP reputations, as well as the reputation of content, structure, links, images and attachments. Protect against directory harvest attacks (DHAs) and denial of service (DoS) attacks and ensure sender validation. Uncover new threats and hidden known threats with a Support Vector Machine (SVM) algorithm, adversarial Bayesian filtering, image analysis and gibberish detection. Identify spoofed mail and reduce spam and phishing attacks with powerful Domain-based Message Authentication, Reporting and Conformance (DMARC) email authentication technology. Get reports on sources and senders of email, so you can detect and shut down unauthorised senders falsifying email with your address. Receive real-time threat updates from the SonicWALL GRID network and ensure delivery of good email. The GRID network collects and analyzes information from industry threat lists, performs rigorous testing and evaluation of millions of emails every day, and establishes reputation scores for senders and content, identifying new threats as they occur. Ensure your anti-spyware and anti-virus is up to date, with SonicWALL GRID Anti-Virus and premium anti-virus signatures from industry partners such as McAfee, Kaspersky, and Cyren. Safeguard your network from the time a new virus outbreak occurs until the time an anti-virus signature update is available with the predictive technology of SonicWALL Time-Zero virus protection. Comply with regulatory mandates using advanced compliance scanning, management and, optionally, email encryption, to prevent confidential data leaks, regulatory violations and to ensure the secure exchange of sensitive data. Configure policies at the organizational level to scan outbound email content and attachments for sensitive data and route email for approval, archiving or encryption. Track encrypted email to confirm time of receipt and time opened. Recipient receives a notification email with easy instructions to log into a secure portal to read or securely download the email. No additional client software is necessary and, unlike competitive solutions, the encrypted email may be accessed and read from mobile devices and laptops. Get automatic spam filter updates and easily synchronize with LDAP. Achieve simple email management with customizable, at-a-glance dashboard. Multi-tenancy support allows large enterprise or managed service provider deployments with multiple departments or customers to establish organizational units with one or multiple domains. The deployment may be centrally managed, but still allows a given organizational unit to have its own users, sub-administrators, policy rules, junk boxes and more. Delegate spam management to end users and give them the freedom to personalize the aggressiveness of their spam-detection settings, while IT continues to control the overall level of security enforcement. Easily customize granular or system-wide reports and charts on threats, compliance, policy, connection management and more, with the customizable, drag and drop dashboard. Automatically generate reports as required.